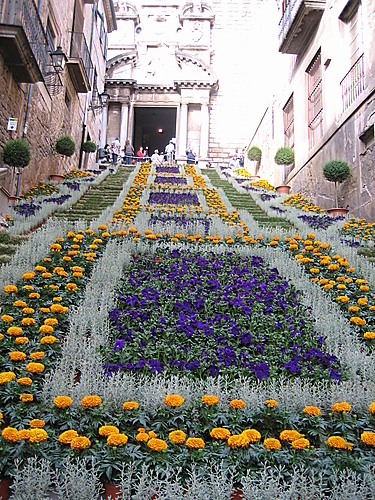 FOR nine days in May the northern Spanish city of Girona becomes a giant garden with a wealth of scent and colours as it celebrates the festival of ‘Temps de Flors’. The fiesta, now in its 49th year, sees traditional and innovative displays of flowers and plants in dozens of locations. Based mainly in the old town, the festival includes monuments, churches, as well as public and private gardens and patios. Whether you are a keen flower arranger or not the festival is well worth a visit as the doors to some of the most beautiful buildings in the city are opened to the public for these few days. And, if like me, you’re a bit of a nosy parker, it’s the perfect excuse to have a look around. Temps de Flors, or flowers time, was first held in 1954 in the Municipal Theatre, sponsored by the City and Provincial Councils and organised by the Sección Femenina. This was an organisation started before the Spanish Civil War and, set up by Pilar Primo de Rivera, sister of José Antonio, founder of the Falange. The organisation was linked to the Fascist party and while men did military service women would join the Sección Femenina, seeing it as their way of serving their country. After the war it became a conservative organisation defending the values of women in society before it was disbanded. The success of the first Temps de Flors forced the women to continue the festival and find a more suitable venue, and at the same time promote the city’s rich heritage. Each year different sites around the city joined the celebration of flowers, from former monasteries, monuments, small churches and restored public gardens. From 1979 the festival was managed by the Association of Friends of Flowers and Gardens and dozens of gardening enthusiasts, garden traders, garden schools, artists, designers, landscape gardeners and school boys and girls joined together to decorate the old town. In 1982, private courtyards joined the event. This year, from Saturday 8 May until Sunday 16 May, once again the old stones combine with nature to reveal a new city to both the people of Girona and to the expected 400,000 visitors. While most of the displays are traditional in their design, many are quite innovative, using unexpected items like apples or cabbages, and are quite unlike flower arrangements which would be seen at a flower festival in an English country church. The wealthiest city in Spain, Girona is a place of strong Catalan tradition, where Castellano is viewed by many as a second language. The locals are very proud of their culture and heritage and above all their language, hence the name Girona, which is Gerona in Castellano. Built along the river Onyar, Girona is a beautiful city with an eclectic mix of architecture, which gives a clue to its rich history. Situated on the Via Augusta, one can stand in the narrow cobbled streets and imagine the sounds of a Roman legion passing through the city, when it was the Roman fortress of Gerunda. After the Moorish invasion of Spain, Girona was occupied by the Arabs for more than 200 years and for six centuries there was a Jewish presence in the city, leaving its mark in the form of the Jewish quarter which still remains today. The Jewish ghetto, or Call, is one of the best preserved in Europe and always takes part in the Temps de Flors. During the 12th century the Jewish community in Girona flourished but its history in the city ended abruptly in 1492 when the Catholic Kings expelled all the Jews from Spain. Girona has been besieged no less than 21 times and in the 19th century withstood five attacks, including a seven month siege by the French in 1809. Rising magnificently above the city is the Gothic cathedral with its single tower, which may appear somewhat lopsided. It is said that a second tower was due to be added but the money for it was used to defend the city against yet another attack by the French. But how much truth there is in this, I don’t know. La Seu, meaning holy see, as the cathedral is known, is famous for its huge Gothic nave, the widest in Medieval architecture, as well as the Baroque steps leading up to the cathedral. These are the largest of their kind in Europe and well worth the climb to the top. Their size and prominence makes them totally unique. Inside the cathedral has no aisles, just a huge sense of space interrupted only by the enormous organ which was added a century ago. During the Temps de Flors the crypt of the cathedral and its garden are on display and beautifully decorated with flowers. This is also one of the few times in the year when the tower of the cathedral is open to the public, offering spectacular views across the city. The Banys Arabs, or Arab Baths, are believed to have been designed by Moorish craftsmen in the 13th century, some two hundred years after the Moors’ occupation of Girona had ended. The baths have three main rooms for different temperatures and the niches and columns lend themselves well to the large arrangements of gladioli and lilies. Temps de Flors organiser Maria Cobarse, along with her co-founder Maria Bachs, has been involved with the festival since it began in 1954. Maria Cobarse said: “It’s a tradition but there is a lot of work to do all year round, speaking to people, looking for places and organising it. After exploring the narrow streets of the old town, if you have any energy left, a walk along the city walls is a must for the great views it gives. Another of Girona’s best known landmarks is the blunt tower of the church of St Feliu. The tower was shortened by lightning in 1581 and never rebuilt. Although the church normally does not participate in the Temps de Flors festival, it cannot be overlooked as it appears on every picture postcard of Girona.